-There’s an early moment in the car in which Joseph Gordon-Levitt looks at his sleek red car. He takes his thumb and rubs out a smudge. It’s a classic moment seen in a number of movies, but I couldn’t help but see this as Johnson’s approach to making movies. His films are slick and no detail is left to chance. They are tightly wound in both their narrative structures. His films aren’t puzzles in that they suggest “whodunits,” but that they are built from details into nifty little, closed-world circuits. -That being said, Johnson’s films are not devoid of content underneath their exteriors. In fact, Johnson seems to be a scholar of film noir than anything else. He seems to use non-noir genres to question various aspects that make up the noir stories. Brick took the form of a high school drama in order to explore the fundamental noir property of the environment in which structural crime develops. The Brothers Bloom changed the inevitability of failure the con movie (which started as noir – see The Asphalt Jungle and Odds Against Tomorrow) by trying to reverse it in both outcome and tone. 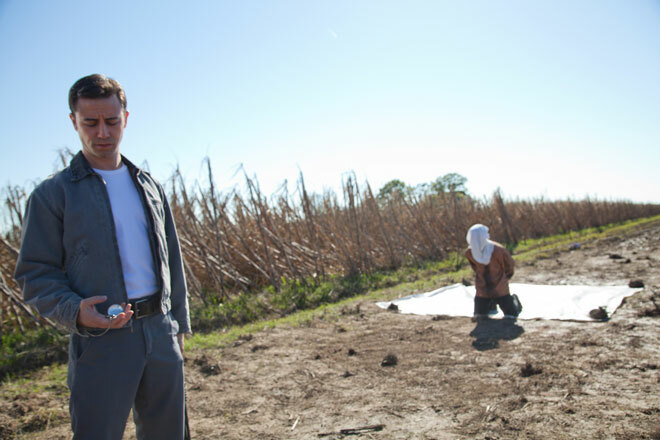 And now with Looper, he again takes the question of guilt to pervades noir, and turns it toward not one’s past but one’s future. 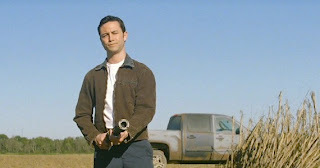 Burt Lancaster says in The Killers, “I did something…once.” Joe (JGL) hasn’t done anything wrong yet, but he will become something hideous and horrible, and thus must hunt himself (Bruce Willis) down. -Johnson is such a talent behind the camera and it shows in how giddy he seems. Tracking shots, trick shots, and old school production design (the completely useless hoverbikes): Looper really shows someone who loves movies. But this is all in service of his characters. My two favorite pair of shots are when we see two events (the first stand off, and Young Joe falling from the ledge) from different perspectives, and it totally works not because hey that’s really cool, but also because it speaks to the film’s dual yet similar perspective. -This film isn’t perfect, and one of the huge issues for me is Kid Blue. Why include this character really? Noah Segan is a charming performer – I quite enjoy him in Brick – but his character seems to show up time after time to move the plot along. He seems too much like a puzzle piece, and his final scene is really pointless. -I really dug the make up and how they went through with it. Gordon-Levitt still looks like Gordon-Levitt, but there are times where you just see Bruce Willis. Part of this is Gordon-Levitt’s terse, pared down performance. He gets the mannerisms and the glare. I heard an interview with Johnson who said that people would forgive the make up if the performance carried it. He was right. 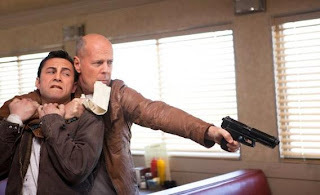 -One of the major complaints at this film is that it takes us away from the city and the central relationship between the two Joes, and instead throws us into a completely different story. It is certainly jarring to go from what seems like hard-boiled classic film noir to a farm in the middle of nowhere, but so does On Dangerous Ground. But on a more thematic note, the story of Cid is essential to the film, not in its “Baby Hitler” time travel paradox question, but more again relating to this idea of noir and escaping one’s fate based on past failures yet made in the future. And while it might not be as exciting, there are certainly a number of exciting scenes (especially anything involving Garret Dillahunt). It does take away from some of the payoff of the end, especially because you really want to see these guys confront each other more, but it still felt pretty damn intense and well played out. -The brilliant part of separating these characters really, is that it allows Old Joe to become the monster Young Joe must destroy. At first, it’s all about preserving himself as he is, and that’s why he must hunt his self down. But as the narrative progresses and we see Old Joe do some pretty terrible things (the assault on the mob is quite villainous, and features that shot of Willis just covered in blood, and that’s not to mention a certain child killing that goes on), Young Joe slow realizes that it’s not about killing his older self, but killing the monsters inside him that will become him. And that’s what Johnson understands about noir. These stories always start at the end. The man is guilty, and thus must meet his fate. But in Looper, man is always guilty. The events that will define his guilt, are simply to come.